We’ve left the original post unchanged, with addenda when changes have been made. A new release of dplyr (0.8.0) is on the horizon, roughly planned for early January planned for February 1st. Since it is a major release with some potential disruption, we’d love for the community to try it out, give us some feedback, and report issues before we submit to CRAN. This version represents about nine months of development, making dplyr more respectful of factors, and less surprising in its evaluation of expressions. In this post, we’ll highlight the major changes. Please see the NEWS for a more detailed description of changes. Our formalised process for this release is captured in this issue. The algorithm behind group_by() has been redesigned to better respect factor levels, so that a group is created for each level of the factor, even if there is no data. This differs from previous versions of dplyr where groups were only created to match the observed data. This closes the epic issue 341, which dates back to 2014, and has generated a lot of press and frustration, see Zero Counts in dplyr for a recent walkthrough of the issue. Where previous versions of dplyr would have created only two groups (for levels a and b), it now creates one group per level, and the group related to the level c just happens to be empty. When factors and non factors are involved in the grouping, the number of groups depends on the order. At each level of grouping, factors are always expanded to one group per level, but non factors only create groups based on observed data. In this example, we group by f1 then x. At the first layer, grouping on f1 creates three groups. Each of these groups is then subdivided based on the values of the second variable x. Since x is always 1 when f1 is a the group is not further divided. The last group, associated with the level c of the factor f1 is empty, and consequently has no values for the vector x. In that case, group_by() uses NA. When we group by x then f1 we initially split the data according to x which gives 2 groups. Each of these two groups is then further divided in 3 groups, i.e. one for each level of f1. We’ve added the possibility to drop the empty groups, and hence get the previous behaviour by using group_by(.drop = TRUE). This is not the default value, because we still strongly believe that all levels of factors should be represented in the grouping structure. The grouping structure is more coherently preserved by dplyr verbs. In particular the result of filter() preserves the grouping structure of the input data frame. The resulting tibble after the filter() call has six groups, the same exact groups that were made by group_by(). Previous versions of dplyr would perform an implicit group_by() after the filtering, potentially losing groups. As opposed to what is described above, feedback from this post led us to change the default value of .preserve to FALSE, and update the algorithm to limit the cost of preserving. Furthermore, the group_trim() function has been added. group_trim() recalculates the grouping metadata after dropping unused levels for all grouping variables that are factors. The primary use case for these functions is with already grouped data frames, that may directly or indirectly originate from group_by(). These functions are related to each other in how they handle and organize the grouping information and who/what is responsible for maintaining the relation between the data and the groups. When using group_nest() the data is structured as a data frame that has a list column to hold the non grouping columns. The result of group_nest() is not a grouped data frame, therefore the structure of the data frame maintains the relationship. When using group_split() the data is split into a list, and each element of the list contains a tibble with the rows of the associated group. The user is responsible to maintain the relationship, and may benefit from the assistance of the group_keys() function, especially in the presence of empty groups. The subset of the data for the group, exposed as .x. The lambda function must return a data frame. group_map() row binds the data frames, recycles the grouping columns and structures the result as a grouped tibble. group_walk() can be used when iterating on the groups is only desired for side effects. It applies the formula to each group, and then silently returns its input. This has been reverted for filter() due to popular demand. Calling filter() on a grouped data frame leaves the rows in the original order. What’s hybrid evaluation again ? Hybrid evaluation is used in summarise() and mutate() to replace potential expensive R operations by native C++ code that is group aware. In the example, the base::mean() function is never called because the hybrid alternative can directly calculate the mean for each group. Hybrid evaluation typically gives better performance because it needs fewer memory allocations. In constrast, hybrid evaluation can directly allocate the final vector, and calculate all 3 means without having to allocate the subsets. The gain of replacing parts of the expression with the result of the hybrid versions was minimal, and the we had to rely on brittle heuristics to try to respect standard R evaluation semantics. The new hybrid system is stricter and falls back to standard R evaluation when the expression is not entirely recognized. The first step of the new hybrid system consists of studying the expression and compare it to known expression patterns. If we find an exact match, then we have all the information we need, and R is never called to materialize the result. When there is no match, the expression gets evaluated for each group using R standard evaluation rules in the data mask: a special environment that makes the columns available and uses contextual information for functions such as n() and row_number(). When summarise() or mutate() use expressions that cannot be handled by hybrid evaluation, they call back to R from the C++ internals for each group. This is an expensive operation because the expressions have to be evaluated with extra care. Traditionally it meant wrapping the expression in an R tryCatch() before evaluating, but R 3.5.0 has added unwind protection which we exposed to Rcpp. Consequently, the cost of evaluating an R expression carefully is lower than before. 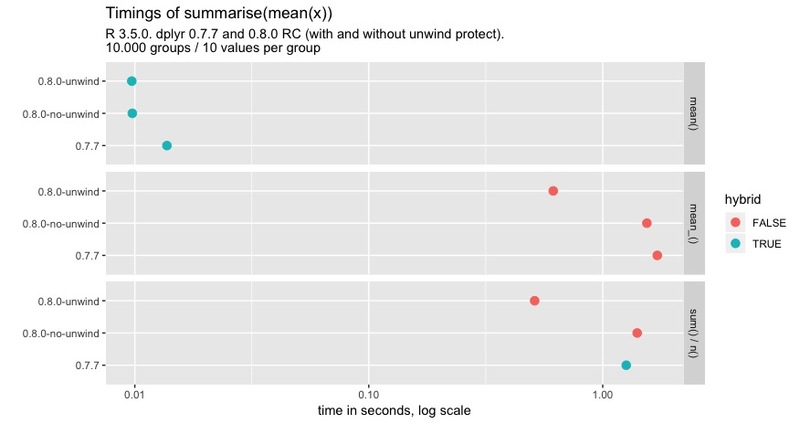 We ran a benchmark calculating the means of 10,000 small groups with the release version of dplyr and this release candidate with and without using the unwind protect feature. Just using the mean() function would not illustrate the feature, because dplyr would use hybrid evaluation and never use callbacks to R. So instead we defined a mean_ function that has the same body as base::mean(). We also compare this to the expression sum(x) / n() because it woudld have been handled by partial hybrid evaluation in previous versions. unwind protection has no impact when using the hybrid evaluation, this is not a surprise because the hybrid path does not call back to R.
hybrid evaluation performs better on the release candidate. This is a direct consequence of the redesign of hybrid evaluation. unwind protection gives a performance boost mean_(). Please note that the x axis is on a log scale. unwind protection more than compensates for no longer using partial hybrid evaluation. The nest_join() function is the newest addition to the join family. #> Joining, by = "name"
A nest join of x and y returns all rows and all columns from x, plus an additional column that contains a list of tibbles. Each tibble contains all the rows from y that match that row of x. When there is no match, the list column is a 0-row tibble with the same column names and types as y.
semi_join() is a nest_join() plus a filter() where you check that every element of data has at least one row. anti_join() is a nest_join() plus a filter() where you check every element has zero rows. The scoped (or colwise) verbs are the set of verbs with _at, _if and _all suffixes. These verbs apply a certain behaviour (for instance, a mutating or summarising operation) to a given selection of columns. This release of dplyr improves the consistency of the syntax and the behaviour with grouped tibbles. This is now the preferred syntax for passing functions to the scoped verbs because it is simpler and consistent with purrr. Counting from dplyr 0.8.0, the hybrid evaluator recognises and inlines these lambdas, so that native implementation of common algorithms will kick in just as it did with expressions passed with funs(). Consequently, we are soft-deprecating funs(): it will continue to work without any warnings for now, but will eventually start issuing warnings. Summarising operations (summarise_all() and summarise_if() ignore grouping variables silently because it is obvious that operations are not applied on grouping variables. On the other hand, it isn’t as obvious in the case of mutating operations (mutate_all(), mutate_if(), transmute_all(), and transmute_if()). For this reason, they issue a message indicating which grouping variables are ignored.